I learn something new about January 12th, 2010 every day. Rarely does a meal go by without some talk of how life has been affected by the earthquake, or about a heart-wrenching story heard by a sister. About a week ago, Sr. Monique Bellegarde let Joyce and I tag along with her to her mother’s house. She had some work to do, and Joyce and I were eager for a little adventure. The chore was to take from the house of any remaining salvageable items, such as the wooden door frames and glass slates from the windows. These resources are expensive and could easily be reused when the house is rebuilt. The house, obviously, was in bad shape. The earthquake didn’t completely destroy it. At least you could tell it was originally two stories. When I packed for Haiti, I had thought I’d be more involved with construction, so I brought lots of tools. I was excited to get to use some of them! We pulled out the dust masks, grabbed some pliers and went to work extracting glass window panes. It was such an odd feeling being in a crooked house. I had to lean over to stand straight… which played a few tricks on my mind and made me dizzy! As we worked, Sr. Monique recounted her terrifying story with us. She was at her mother’s house that evening, in a hallway, when the earth started to shake. She tried to explain the horrendously loud noise- but you can’t replicate something like that. What does it sound like to have all the buildings around you crash to the ground? What does it sound like to have your neighbors buried alive? What sensation reaches your ears as everything tumbles from the walls and shatters around you? How does it feel to fight through stuff to run towards your aged mother you find on the floor of the porch? I don’t know those answers. But Sr. Monique does. And as good as she is at recounting her experience, I just can’t imagine it…despite the fact that I stand in the exact same place and can see the terrible effects of what happened that day. Yet life continues. There’s building to be done! SOS! “Support Our Students” Sponsorship Project was born on the poverty-stricken countries we visited. Seeing children working, begging, taken advantage of, or simply just not attending school, I wondered how in the world they could ever break the vicious cycle of poverty they were in. Our goal is to prevent, especially women and children, from remaining in their abject poverty by empowering them through education to create the necessary conditions for a new future in which they can provide for themselves and live in peace and security. 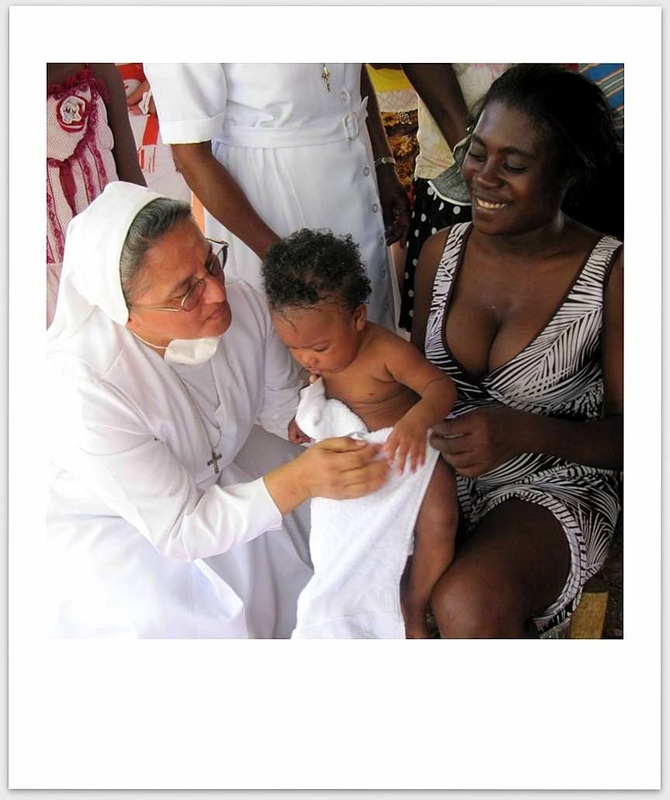 Haiti's flood victims are in desperate need of our help and contributions. With almost no resources, the Haitians are most vulnerable to natural disasters. The news show us the devastation of the hurricanes and told us of the heavy losses. The destruction caused by the strong winds and heavy rains cause havoc. Without the means to start over again, for most victims the only future they have left is one of dependence on humanitarian aid handouts. ”Unemployment exceeds 70%; families struggle every day to find food and they often live in tattered cardboard houses. There is widespread suffering from severe malnutrition and resulting diseases. The infant mortality rate is one in ten. Health services are overwhelmingly lacking, and years of neglect of schools has resulted in illiteracy rates exceeding 60%. Even safe drinking water is available to only 13% of the population.” [Source: www.heritagekonpa.com/hkhome.htm] Our sponsors and volunteers are helping in whatever way they can—financially, in community outreach, and in our schools and orphanages.